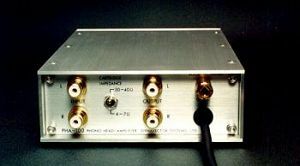 The Dynavector phono head amplifier PHA-100 is a complete redesign of our original head amplifier the PE-1, using new circuitry and the most advanced and highest quality IC's resistors and capacitors currently available. The PE-1 was designed more than 15 years ago using an entirely new patented circuit. During the development of the highly acclaimed XV-1 cartridge, its performance was optimized through the use of the original PE-1, making it superior to any other cartridge available.To build on this, we decided to redesign the PE-1 with the specific aim of making it the most advanced head amplifier available for the new cartridge. The result is that the performance of the PE-1 has been significantly improved following intensive design work and after comparing many prototypes using alternative components. The result is the PHA-100. Important factors in reproducing music such as the preservation of natural ambience, a wide dynamic range and harmonic fidelity are easily overlooked by conventional methods of amplifying the signal of the cartridge? output voltage. There is no shortage of expensive head amplifiers and step up transformers for MC cartridges on the market, all of which have the aim of amplifying the very low output voltage of MC cartridges with the highest fidelity. In the PHA-100 the maximum current is taken from the cartridge by an active electronic circuit. This current is then converted to a voltage sufficient to drive a conventional preamplifier. For the PHA-100, the current sensitivity of the cartridge is the most important consideration. By using current amplification, the magnetic distortion of MC cartridges is significantly reduced but the S/N ratio was still a problem when the PHA-100 was designed 15 years ago. Today, thanks to the latest technology and components, very low noise operational amplifiers are available and the S/N problem of head amplifiers has been solved. Dynavector is proud of its long record of innovation in the hi-fi field. Our DV-DRT XV-1 cartridge, DV-PHA-100 head amplifier and DV SuperStereo processors are our answer to a digital industry threatening to destroy much of the great recorded musical heritage of the last century. The PHA-100 makes use of a unique patented circuit designed to provide the maximum fidelity from vinyl sources. By using the patented current amplification, magnetic distortion of MC cartridge can be reduced considerably. You can easily recognize the sound quality is different from any other head amplifier or step-up transformer. The PHA-100 has an impedance selection switch to provide the correct match for either low or medium impedance MC cartridges. You can easily select the position suited to your cartridge. All the electronic devices are selected by the several listening tests. R core antistatic transformer is being used to avoid the noise. Size & Weight Main unit: 120w x 176D x 45H mm, 900g. Power unit: 82w x 132D x 45H mm, 800g.